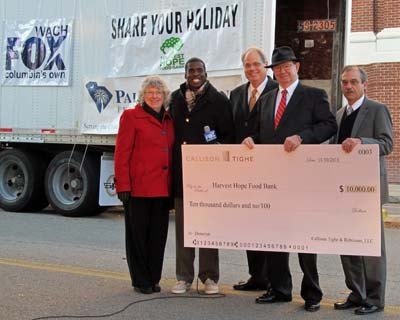 COLUMBIA, S.C. – For the third straight year Callison Tighe & Robinson has reached out to those in need during the holiday season with a $10,000 contribution to Harvest Hope Food Bank. As the firm made the contribution Wednesday morning, Detwiler challenged other Columbia law firms to match it. The organization assisted 2 million people in 2010, and the holiday season is a crucial time. “As recently as last month, some Harvest Hope pantries were empty due to high demand,” Detwiler said. “Each year, more than half of their clients say they’ve had to choose between paying for food and paying utilities. No one should have to make such a choice,” he said. Harvest Hope’s programs range from emergency food pantries to distribution of commodity foods, with 98 percent of the donations collected going directly to people who need help. Harvest Hope also operates a mobile food pantry for those living in communities without access to the organization’s regular food pantries, and it helps with programs that provide for children after school and during times when school isn’t in session. According to the nonprofit Feeding America, more than 12 million children in the United States are “food insecure” – unable to consistently access adequate amounts of nutritious food necessary for a healthy life. That number includes 20 percent of South Carolina’s children. Harvest Hope Food Bank is a 501(c)(3) non-profit organization. Beginning in 1981 as an emergency food box program, Harvest Hope is now a regional distribution program that collects, stores and distributes food and related items to more than 400 agencies engaged in feeding needy, elderly and ill families and children in 20 counties in central South Carolina. To make a donation to Harvest Hope, go to http://www.harvesthope.org/ and click on “Donate Now,” or call (803) 254-4432.